Prepping my hair before styling is a massive step in my hair care routine. Having long, fine hair with lots of it can leave my hair either a variety of ways flat straight to my head, weighed down with the wrong sorts of products, one big lions mane or generally just not sitting right on my head. I've been testing out product combinations for a while to give me root lift while also leaving my hair in tip top condition with minimal volume loss. Prepping my hair before blow drying and styling makes sure it doesn't look like I've just wacked a load of product in it or roughly dried it while I lay down (I have actually done this before… a few times…). First off after washing and leaving my hair for about a hour while wrapped up in a hair towel. I like to use one of those hair turbans to make sure I take all the excess moisture out before adding products and drying. Although it's adding a hour or two to my routine is does mean I can use less heat on my hair. I take a few pumps of my favourite hair oil the Wella SP Luxe Oil. This is a really lightweight product that has a gorgeous scent of almond oil and also contains Argan Oil and Jojoba Oil that leaves the hair silky smooth and soft. I work this into the very ends of my hair and then work any excess towards the roots. I then pick my prepping product. 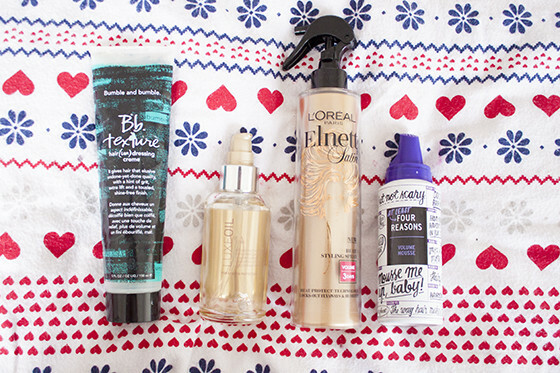 I either use a mousse, a texurising cream or a spray depending on the looks that I want to achieve. I wear my hair normally in three different ways, straight and volumised, soft and beachy or curled. I try to prep with the right product for that look so here's my simple guide on what I use to create each look. Messy hair is my thing and I always try to embrace it but I find it always needs a product to get it ready for styling. For a this undone look I tend go for Bumble and Bumble Texurising Creme. This was a firm favourite of mine for a while as I loved the beachy look it gave my hair without weighing it down. I would normally take about a 50p sized dollop and apply it to the mid sections of my hair, avoiding both the roots and the ends. I'd then flip my hair over and give it a good blast with a hair dryer. I currently actually quite like wearing my hair straight and natural. If I want to go for a sleeker but volumised look I tend to reach for the L'oreal Ellnett Heat Styling Spray in Volume. This is perfect for those days when you want to wear your hair straight but also have some lift. I spray this all over my hair and then flip it over and do the same. I then comb through with a wide tooth comb to distribute product evenly and then blast it with a hair dryer. This also contains heat protectant up to 230C which is a bonus. This is one of my favourite products to use when styling my hair at the moment as I light to wear it straight with a little bit of lift. Now mousse is a tricky one. I've tried it countless times before as a volume booster but I've been left with crispy, not very nice looking hair. However I've been using this Four Reasons Volume Mousse and it's actually been doing a pretty good job. Not to mention the super cute packaging this mousse is light and perfect for adding to the roots. I take a good dollop and flip my hair over and work it into the root area, focusing on the crown. I tend to use mousee on those days I want to style my hair with heat as I feel it gives something to my hair that makes it easier to hold a curl or a wave. It's a great product to use when prepping your hair but you do need to be careful not to overload!